Steve Latta taught me how to make a plug cutter from a piece of brass tubing in a class he taught on line & berry string inlay. 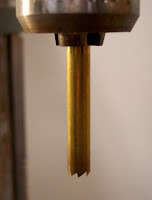 Use a triangular file and file rip cut teeth on the end of the brass tube. I did a quick and crummy job on mine and it still cuts like a champ. One thing to remember is the tube will burn easily so wipe it down with a damp paper towel frequently. Don't cut all the way through your wood because the plug might get stuck in the tube. Instead, cut part way through, put a piece of tape on top of the plugs and saw them off at the bandsaw. The tape keeps the plugs from falling out onto the floor and into the black hole that exists underneath all of our shop storage units.